Except for some states that were extinguished in the 19th century (Arkat, Assam, Awadh, Kodagu, Mahratta states, Pañjab, Utkala), this record contains those Indian ("princely") states that acceded to India with effective date on or after 15 Aug 1947. If no date of accession is noted, 15 Aug 1947 is understood. This list is selective, there 584 states when Britain granted the Indian independence 15 Aug 1947; about 210 are listed here. However, only "states" are included; "estates" (jagir), "estate revenue grants" (thikana), and "land holders" (zamindar) are excluded, no matter how prominent and/or titled their their jagirdars, thakurs, or zamindars were. Obsolete but once official English-language names of the polities are given in parentheses, i.e., Awadh (Oudh). The princely states of India entered into protectorate/tributary relations with Britain by the end of the 19th century, where exact dates are known they are noted. The phrase "British India" is used for U.K. colonial possessions even before 1858, for brevity. 835 AD Legendary foundation of predecessor state Dimasa. 1540 Capital moved to Maibang. 1757 Capital moved to Khaspur. 1830 Annexed to British India. 1270 Kachh (Cutch) state founded. 1864 Kachhi Baroda state (tributary to Dhar). 1005 Traditional date for founding of Kalahandi. 1730 Kambay (Cambay) state founded. c.1812 Kamta estate (jagir) becomes Kamta Rajaula state. 11th cent. AD First modern recorded mention of the state. granted the jagir of Lambagraon) by Treaty of Jawalamukhi. 1846 Annexed to British India. 726 AD Kanika state founded according to tradition. 1817 State reduced to an estate (zamindari). 106 AD Kanker state founded according to tradition. af.1425 Capital moved to Kanker. 1809 - 1818 Occupied by Nagpur. 1545 Kannanur (Sultanate of Lakshadweep and Cannanore) state founded. 1791 - 1792 Occupied by British India. 18 Mar 1792 - 30 Oct 1796 Laccadive Islands and Kannanur annexed to British India. 1799 Amindivi Islands annexed to British India. 1819 Annexed to British India. c.900 AD Karauli state founded. 15 Nov 1817 British protectorate. c.765 AD Kashtwar state founded according to tradition. 1786 - 1786 Occupied by Chamba. 1820 Annexed by Pañjab (Punjab). 1884 - 1894 British India administration. 765 AD Traditional founding date of predecessor state. 1803 - 1814 Occupied by Nepal. 1833 Khairagarh estate (zamindar) founded. 1873 - 1893 British India administration. 1898 Khairagarh recognized as a state. 10th cent. Khaneti state founded. .... - .... Tributary to Bashahr. 1857 Kharsawan estate recognized as a state. 1829/1841 Khasi states (eventually 25 states) under British protection. 1853 Shillong, premier state of Khasi, divided into Khyrim and Mylliem. 22 Aug 1946 Federation of the Khasi States established. 25 Jan 1950 Khasi states merged into Assam. .... Khirasra state founded by a scion of Dhrol. 26 Mar 1818 British protectorate. 1510 Koch dynasty gives its name to the state. 1711 - 1738 Under Mughal suzerainty. 12 Aug 1765 Under British India suzerainty. 1770 - 1774 Under Bhutanese suzerainty. 5 Apr 1773 British protectorate. Late middle ages Perumpadappu (Kochin) state founded. 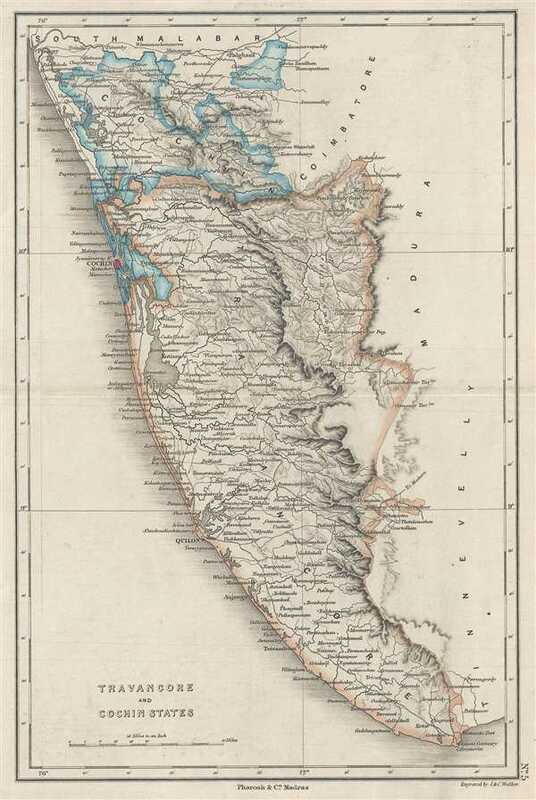 ... - 1503 Vassal of Calicut (Kozhikode). 1503 - 1663 Portuguese protectorate. 1663 - 1795 Dutch protectorate. 1795 British protectorate (confirmed 6 May 1809). 1 Jul 1949 Merged into United State of Travancore and Cochin. Middle Ages Kodagu (Coorg) state in the southern Dekkan founded. 1780 - 1788 Occupied by Mahisur (Mysore). 26 Oct 1790 British protectorate. 11 Apr 1834 State extinguished and annexed to British India. c.1698 - 1818 Tributary of the Peshwa. 1840 - 1841 British Indian administration. 1841 Annexed to British India. 1710 Former ruler Shivaji II of Satara founds Kolhapur state. 1 Oct 1812 British protectorate. 24 Dec 1819 British protectorate. 1631 Kota state secedes from Bundi. 18 Jun 1707 - 8 Sep 1713 Re-united with Bundi. 26 Dec 1817 British protectorate. ... - 182. Tributary to Pañjab (Punjab). 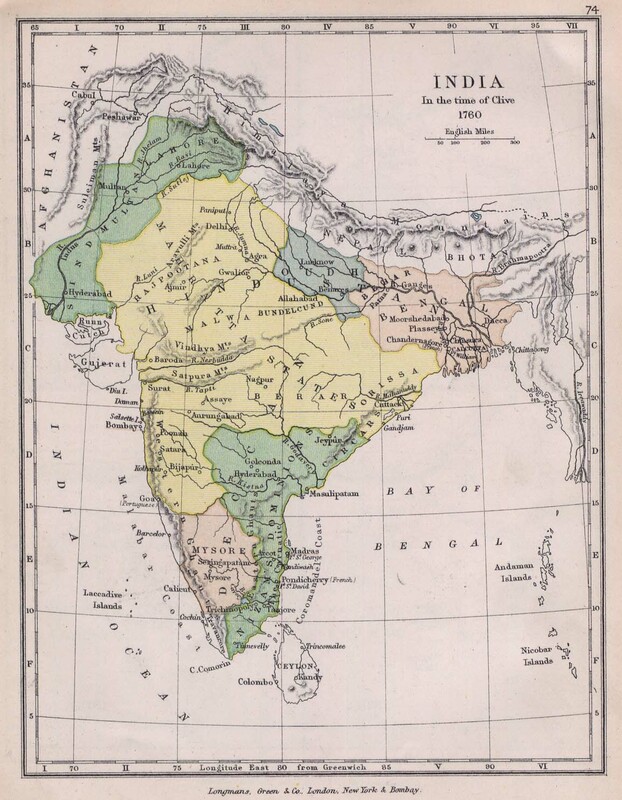 Jan 1828 Annexed to British India. 27 Apr 1766 - 1792 Annexed by Mahisur (Mysore). 18 Aug 1792 British protectorate. 15 Nov 1806 Reduced to an estate (zamindari). c.500 Kullu state founded in remote legendary antiquity. 1841 Annexed to the Pañjab (Punjab). 9 Mar 1846 Annexed to British India, as an estate (jagir). .... - Feb 1816 Tributary of Bashahr. 1839 - 1840 Occupied by British India. 5 Apr 1854 Kurandvad state split into Senior Branch and Junior Branch. 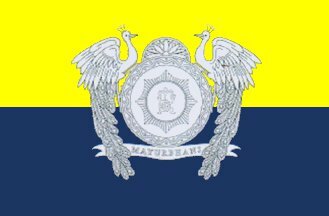 5 Apr 1854 Senior and Junior branches split the Kurandvad state. .... Kurnool state established by a Pathan general. 1839 Annexed to British India. 750 AD Kutlehar state founded according to tradition. 1805 - 1809 Occupied by Nepal. 1825 Annexed to Pañjab (Punjab). 1867 - 1880 British administration. bf.1350 Mahisur (Mysore) state founded. of Mughal Empire, with himself as ruler, styled Padshah. 30 Jun 1799 Mahisur state restored as a British protectorate. 19 Oct 1831 - 25 Mar 1881 Part of British India (Mysore province). 15 Aug 1947 Accedes conditionally to India. 28 Jun 1949 Accedes fully to India. bf.1600 Mahlog (Mahilog) state founded. .... - 18.. Subject to Bilaspur. family displaces an earlier lineage in Tanjur (Tanjore). 1734 The Mahratta state of Nagpur becomes de facto independent. 11 Jun 1793 Tanjur a British protectorate. 3 Jun 1818 The "Peshwa's Dominions" are annexed to British India. 25 Sep 1819 Satara a British protectorate. 11 Dec 1853 Nagpur is annexed to British India. 30 Oct 1855 Tanjur (Tanjore) fortress is annexed to British India. Jul 1857 - 1857 Rebellion by son of the last peshwa. 1788 - 1790 Occupied by Banda. Dec 1890 - 1893 British administration. 1468 Predecessor state founded as a jagir. 1657 Maler Kotla state founded. 3 May 1809 British protectorate. 1733 Bantva-Manavadar estate (jagir) created . 14 Sep 1947 Accedes to Pakistan. 22 Oct 1947 India takes over administration. 15 Feb 1948 Rescinds accession to Pakistan, accedes to India. c.1290 Rana of Banglaor succeeds to Siokot state. 1527 New capital Mandi founded; state takes name from capital. 20 Dec 1815 British protectorate. 35 AD Manipur state founded according to tradition. 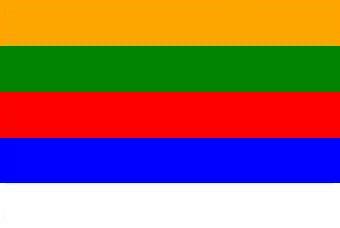 1819 - 12 Jun 1825 Occupied by Burma. 1851 Manipur declared a British protected state. 27 Apr 1891 British capture Kangla palace. 15 May 1907 Manipuri language announced as official language of Manipur. 15 Aug 1947 End of British paramountcy, India becaomes independent. 28 Aug 1947 Declaration of sovereignty and independence of Manipur. 15 Oct 1949 Accedes to India (signed 21 Sep 1949). 1820 Miraj state split between Senior Branch and Junior Branch. c.1227 Mohanpur predecessor state founded. 1670 Mudhol estate becomes a state. 1842 Muhammadgarh state formed from parts of Basoda and Kurwai. 13 Oct 1657 Multhan state founded. 1720 Renamed Nagodh after new capital. 1807 - 1809 Tributary to Panna. 1857 - 1860 Administered by British India. 1865 Nandgaon estates (zamindari) recognized as a state. 1785 - 1799 Occupied by Mahisur (Mysore). 3 Jun 1858 Annexed to British India. 1681 Narsinghgarh (Narsingarh) estate founded. May 1872 Narsinghgarh estate recognized as a state. 1664 - 1673 Mughal occupation. 23 Feb 1812 British protectorate. 1095? Nurpur state founded (then called Dhameri). 1815 Annexed to Pañjab (Punjab). 28 Jan 1757 Annexed to Afghanistan. 7 Apr 1799 The Sikh military organization (Khalsa) occupies Lahaur (Lahore). 12 Apr 1801 Pañjab (Punjab) state established. 1816 - 17 Jun 1822 Jammu annexed to the Punjab. 5 Jul 1819 - 15 Mar 1846 Kashmir annexed to the Punjab. 9 Mar 1846 British protectorate by the Treaty of Lahore. 22 Feb 1849 Ruler deposed. 8 Apr 1849 Punjab incorporated into British India. 15 Aug 1947 Partitioned between India (Amritsar) and Pakistan (Lahore). 1698 Renamed Partabgarh after new capital. 5 Oct 1818 British protectorate. 1794 Pathari estate (jagir) founded. 29 Mar 1761 Patiala state founded. 9 Feb 1809 British protectorate. 1644 - 1651 Occupied by Bijapur. 1 Jan 1825 - 1827 Occupied by Satara. 17 May 1828 - 3 Dec 1841 Occupied by Satara. 17 Nov 1853 - 10 Feb 1860 State under British management. Dec 1882 - Jul 1885 British Indian management. 1547 Piploda founded as a dependency of Jaora. 1924 Piploda a separate state. 15 Jun 1948 Acceded to India. 1819 Annexed by Jammu and Kashmir. 1901 Poonch (Punch) estate recognized as a state by British India. Oct 1947 Occupied by Pakistan, part of Azad Kashmir. 20 Nov 1948 Poonch divided between India and Pakistan. 1205 Predecessor state of Singhbhum founded. 1193 State founded by ruler expelled from Morvi. 5 Dec 1809 British protectorate. 1886 - 15 Sep 1900 Administered by Bombay province. c.1350 Pudukkottai state founded under Pallava dynasty. 16 Dec 1813 British protectorate. 1 Jul 1909 - 27 Nov 1910 British India administration. 1911 Raigarh estate recognized as a state. to 18th cent. Subordinated to Bamra. 21 Oct 1846 Annexed to Jammu and Kashmir. 1720 - 1732 Mughal occupation. 1815 - 1820 Occupied by Baroda. 11 Oct 1821 British protectorate. 1884 - 1897 State under British civil administration. 1742 Ramdurg state, separated from Nargund. 1827 - 1829 British India administration. 1795 - 1803 British occupation. 1803 Reduced to an estate (zamindari). 1719 Rohilla state founded at Aonla; becomes known as Rohilkhand. 23 Apr 1774 State destroyed and most of the state annexed by Awadh. 18th cent. BC Legendary foundation date of Ranpur. Prakash I ruler of Sirmur. 1789 - 1829 Occupied by Keonthal. but does not pay the tribute. 5 Jan 1819 British protectorate. 5 Oct 1812 British protectorate. 1 Apr 1875 - 15 Oct 1895 British India administration. 6 Jun 1791 Sachin state founded. 1835 – 1864 Under British civil administration. 1875 - Feb 1892 British India administration. bf.1493 Sambalpur (also known as Hirakhand) state founded. 1808 - 1817 Maratha occupation. 1818 - 1820 British administration. 1849 Annexed to British India. 1817 Samthar recognized as a state by U.K.
15 Mar 1776 – 1790 Annexed to Mahisur (Mysore) . 27 Oct 1817 - 1 Jul 1818 Annexed to the Peshwa's Dominions. 1 Jul 1818 British protectorate. 5 May 1819 British protectorate. .... - c.1703 Part of Bashahr. c.1703 - 1719 Occupied by Kullu. 1719 - 1803 Part of Bashahr. 1815 - 1841 Restored to Kullu. 1901 - 1914 British India administration. 1255 Sant state founded (named after founder). 1878 - 1889 British India administration. 1779 Sardargarh state created from Gidad area of Bantva. 14 Sep? 1947 Accedes to Pakistan. 1 Oct 1947 India takes over administration. 15 Feb? 1948 Rescinds accession to Pakistan, accedes to India. 7 Apr 1765 British protectorate. 29 Oct 1786 – 17 Dec 1791 Occupied by Mahisur (Mysore). 1620 Singhbhum Pir, later named Seraikella, founded. 1629 Phulia estate jagir renamed Shahpura. the state is referred by this name. c.1450 Siba state, also called Dada-Siba, founded. 1803 - 1813 Occupied by Guler. 1813 - 1830 Annexed by Pañjab (Punjab). 1830 State restored; British protectorate. 11 Sep 1823 British protectorate.